Back in March, Google split Hangouts into two separate apps - 'Meet' for video conferences, and 'Chat' for Slack-style company messaging. 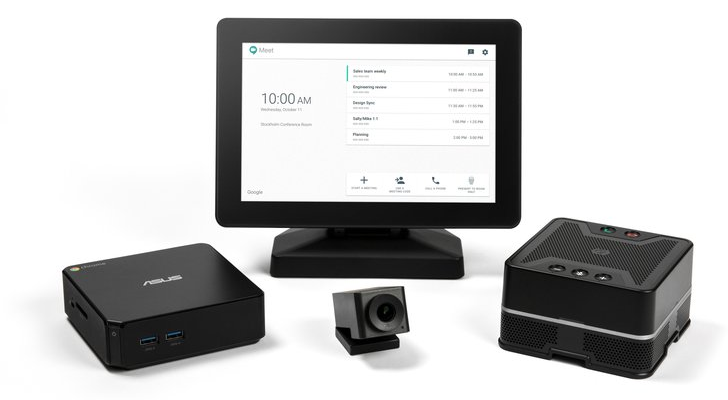 In a new blog post, Google revealed the 'Hangouts Meet hardware kit,' designed to get companies up and running with Hangouts Meet for their boardrooms or other meeting locations. The first component is a Chromebox manufactured by ASUS, which is not only powered by Chrome OS, but also pushes updates to the other components in the kit. Next is a touchscreen for controlling meetings, with the ability to present from a laptop via HDMI, add participants, pin/mute team members, control the camera, and record the meeting to Google Drive (if the company uses G Suite Enterprise edition). Of course, the camera is the most important part of a video conference. The kit comes with a 4K sensor camera with a 120-degree field of view, to capture the entire room. The Chromebox even uses machine learning to figure out where everyone is in the room, and crop/zoom to fit them in. Lastly, the included speaker/microphone unit actively eliminates echo and background noise. Up to five of them can be daisy-chained together with a single cord, providing coverage for larger rooms. The Hangouts Meet kit goes on sale today for $1,999 in select markets. When you consider that a fully-functional computer, a 4K camera, and a high-end speaker/microphone unit are included, that doesn't seem too unreasonable. In addition to the hardware, Google also announced a few new features for Hangouts Meet. If you're a G Suite Enterprise edition customer, you can now host meetings with up to 50 participants, record meetings and save them to Drive, and dial-in to calls in over a dozen countries.